Do you need to become all powerful with college football analytics? The Power Rank can help. The numbers on this site have powered many articles across digital and print media. 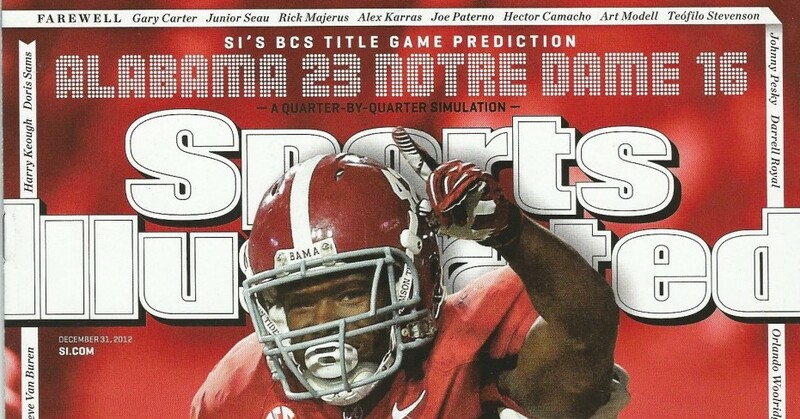 This includes founder Ed Feng’s article predicting Alabama’s win over Notre Dame in the 2012 BCS title game, which appeared on the cover of Sports Illustrated (see above image). You might also be interested in these top 5 pages for college football on this site. These predictions are based on team rankings that take margin of victory and adjust for strength of schedule. During the 2015 season, the public college football predictions on this site predicted the winner in 76.1% of games (570-179, doesn’t include cupcakte FBS vs FCS games). To check out the predictions during the season, click here. To see the raw numbers behind the predictions, check out these rankings. During football season, I offer a sample of my college and pro football predictions usually reserved for paying members of the site. You also get my bracket advice for March Madness. In addition, I keep you up to date on other content such as my preseason college football win totals report. Won a couple bowl pick’em tourneys this year with help from your predictions. The pools I entered were confidence point based and were also against the spread picks. TCU sealed the deal for me in both pools. I promise I will never sell your email address to anyone. And if you’re unsatisfied with the newsletter for any reason, there’s an unsubscribe button at the bottom of every email. Click it and I go away forever. You shouldn’t trust college football statistics on major media sites. They count sacks as rush instead of pass plays, which skews the numbers. To learn more about this common mistake, click here. The Power Rank provides raw yards per play statistics for passing and rushing that counts sacks as pass plays. To check it out, click here. I can’t even begin to pretend you’ll get everything about college football analytics on this site. Other college football rankings are also useful in making predictions. This ranges from the preseason polls to quants that dig into play by play data to rank teams. To check out my essential guide to predictive college football rankings, click here. Need a quick primer on football analytics, both college and pro? I put together a guide on the free articles I’ve found most useful and interesting. To check out my football analytics resource guide, click here.